There is a clear values-based case for promoting gender parity: women are one-half of the world’s population and deserve equal access to health, education, economic participation and earning potential, and political decision-making power. However, it is pertinent to note that gender parity is also fundamental to whether and how economies and societies thrive. Ensuring the healthy development and appropriate use of half of the world’s total talent pool has a vast bearing on the growth, competitiveness and future-readiness of economies and businesses worldwide. This evident relationship between economic outcomes and gender parity and, in particular, the growing evidence of the positive effect of increasing gender parity on national income, is illustrated in Figure 9 (page 28) on the basis of the Global Gender Gap Index. The method of calculating the Global Gender Gap Index is unique in eliminating the direct impact of absolute levels of any of its constituent variables so that, as a result, any relationship to relative wealth of any of the economies covered by the Index is endogenous to the dynamics of closing the global gender gap. As detailed in the previous section of the Report, the Global Gender Gap Index takes into account four critical dimensions when measuring the gaps between women and men’s access to resources and opportunities: economic participation, education, health and politics. Across these four different dimensions we see a number of positive interdependencies as well as knock-on and multiplier effects that highlight the multi-faceted nature of the benefits of increased gender parity. In the political sphere, women’s engagement in public life has a positive impact on inequality across society at large. The issues that women advocate, prioritize and invest in have broad societal implications, touching on family life, education and health. 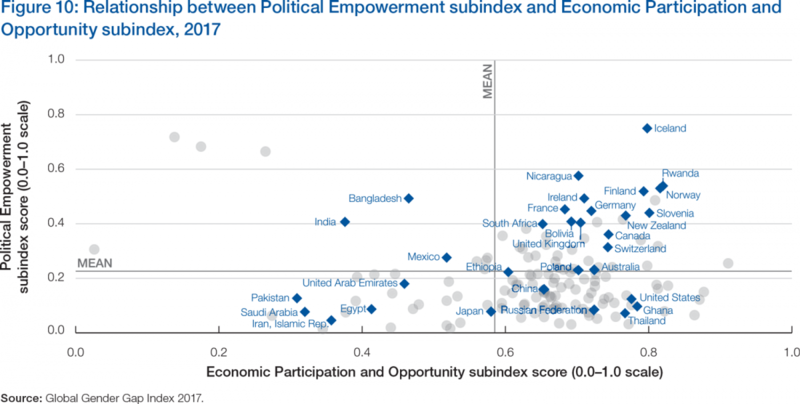 Women’s engagement in public life fosters greater credibility in institutions, and heightened democratic outcomes.25 In addition, there is a range of evidence—including findings by our Index (see Figure 10)—to suggest that women’s political leadership and wider economic participation are correlated. Across all countries, making full use of women’s capabilities paves the way to optimizing a nation’s human capital potential. This is evidenced in the strong relationship between the World Economic Forum’s Global Gender Gap Index and Global Human Capital Index, presented in Figure 11. In other words, top performers in the Global Human Capital Index have succeeded in maximizing the development and deployment of their nation’s talent by also narrowing their gender gaps. Women’s participation in the formal economy, or lack thereof, is also a business issue—costing women, companies and, ultimately, entire economies. Female talent remains one of the most under-utilized business resources, either squandered through lack of progression or untapped from the onset. Business leaders and governments increasingly note that tackling barriers to equality can unlock new opportunities for growth. In the World Economic Forum’s Future of Jobs Survey, 42% of business leaders perceived addressing gender parity in their company as a matter of fairness and equality; yet more than a fifth of those surveyed also highlighted rationales closer to their core business: reflecting the changing gender composition of their customer base as well as enhancing corporate decision-making and innovation. The combined impact of growing gender parity, a new middle class in emerging markets and women’s spending priorities is expected to lead to rising household savings rates and shifting spending patterns, affecting sectors such as food, healthcare, education, childcare, apparel, consumer durables and financial services.26 With women controlling 65% of global household spending and estimated global consumer spending of currently US$40 trillion27 there are large potential benefits for companies with employees who can understand diverse customer bases. Additionally, the global economy is currently in transition to a Fourth Industrial Revolution.28 In such a highly interconnected and rapidly changing world, diversity is critical to informed corporate decision-making and business innovation.29 When it comes to leadership positions, companies with top quartile representation of women in executive committees have been shown to perform better than companies with no women at the top—by some estimates as much as a 47% premium on average return on equity.30 Links also exist between having more women directors and corporate sustainability, as well as with economic growth, since more diverse leadership teams can cater to a broader array of stakeholder needs and concerns.31 Unlocking these benefits requires focused action to address the underlying causes of persistent gender gaps in a systemic way. 13 See PwC, Women in Work Index 2017, https://www.pwc.co.uk/services/economics-policy/insights/women-in-work-index.html, accessed October 2017. 14 See McKinsey & Company, The Power of Parity: How Advancing Women’s Equality Can Add $12 Trillion To Global Growth, 2015. 15 See International Labour Organization (ILO), Economic Impacts of Reducing the Gender Gap (What Works Research Brief No. 10), 2017. 17 See European Institute for Gender Equality, Economic Benefits of Gender Equality in the European Union, http://eige.europa.eu/gender-mainstreaming/policy-areas/economic-and-financial-affairs/economic-benefits-gender-equality, accessed October 2017. 18 See Teignier, M. and D. Cuberes, Aggregate Costs of Gender Gaps in the Labour Market: A Quantitative Estimate (UB Economics Working Papers 2014/308), University of Barcelona, 2014. 19 See ILO and Asian Development Bank (ADB), Women and labour markets in Asia–Rebalancing for Gender Equality, 2011. 20 See World Bank Group, Gender and Development in the Middle East and North Africa: Women in the Public Sphere, 2004. 21 See, for example, the World Bank Group, Gender and Economic Growth Assessments for Kenya, Tanzania and Uganda, 2007. 22 See Chaaban, J. and W. Cunningham, Measuring the Economic Gain of Investing in Girls: The Girl Effect Dividend, (World Bank Policy Research Working Paper), World Bank, 2011. 23 See ILO and ADB, 2011. 24 See Wilhelmson, K. and U. Gerdtham, Impact on Economic Growth of Investing in Maternal and Newborn Health, World Health Organization, 2006. 25 See OECD, Women, Government and Policy Making in OECD Countries: Fostering Diversity for Inclusive Growth, 2014. 26 See Goldman Sachs Global Markets Institute, The Power of the Purse: Gender Equality and Middle-Class Spending, 2009. 27 See Catalyst, Buying Power: Global Women, 2015, www.catalyst.org/knowledge/buying-power-global-women, and Silverstein and Sayre, “The Female Economy”, Harvard Business Review, September 2009. 28 See Schwab, K., The Fourth Industrial Revolution, World Economic Forum, 2016. 29 See Leader-Chivee, L., New Study: Diversity Drives Serial Innovation, Inc.com, 2013, and Deloitte, Waiter, is That Inclusion in My Soup? A New Recipe to Improve Business Performance, 2012. 30 See McKinsey & Company, Women Matter, 2013, and Credit Suisse Research Institute, Gender diversity and corporate performance, 2012. 31 See Galbreath, J., “Are there Gender-Related Influences on Corporate Sustainability? A study of women on Boards”, Journal of Management & Organization, vol. 17, no. 1, 2011, pp. 17-38.